EAACI has a long history and strong ethos in implementing the latest research findings to deliver better healthcare for patients with allergies. Over the last decades this mission has become even more important with allergic diseases now affecting the lives of millions of people around the world. This represents a major burden for patients as well as their clinicians, governments, legislators and regulators. The current challenge is to deliver appropriate treatments that are able to prevent lifetime disabilities, shifting from “treating a disease“ to “promote health” in a sustainable context. Allergen immunotherapy (AIT) has been used for a century. Several terms including “desensitization”, “hyposensitization“ and “vaccines” have been used, and often misused, to indicate administration of incremental doses of allergenic substances to reduce the clinical manifestations of allergy. However AIT has also been the subject of considerable controversy in terms of its efficacy. The dispute has impacted on the dissemination of knowledge about AIT, the availability of the products in many countries and the relevant policies for their reimbursement. Some of these issues result from an inadequate translation of the scientific data into daily practice, with clinical judgment being established on expert opinion instead of the objective evaluation of valid scientific studies. These Guidelines for clinical practice aim to define the current literature and they have synthesized the scientific evidence in a well structured, systematic and reproducible process. This has been combined with the expertise of clinicians, the preferences of patients and the needs of policy makers. The purpose has been to develop clinically valid, operational recommendations which serve as a strong basis to help the allergist to advocate for AIT, practitioners to refer patients onto appropriate management, the patient to request the best standard of care for their disease and quality of life and the regulators to evaluate the sustainability for the health-care system. Of note, these recommendations cannot, and will not, stand forever but will need to be revised as soon as new research developments are available. These guidelines follow the previous guidelines on Food Allergy and Anaphylaxis. Together, they have defined a crucial change resulting in a framework of a rigorous methodological approach for future guidelines. The ambition for EAACI is to drive the perception of clinicians and stakeholders from relying on old “pre-cooked recipes“ to focusing on critical thinking and applicability of the recommendations. 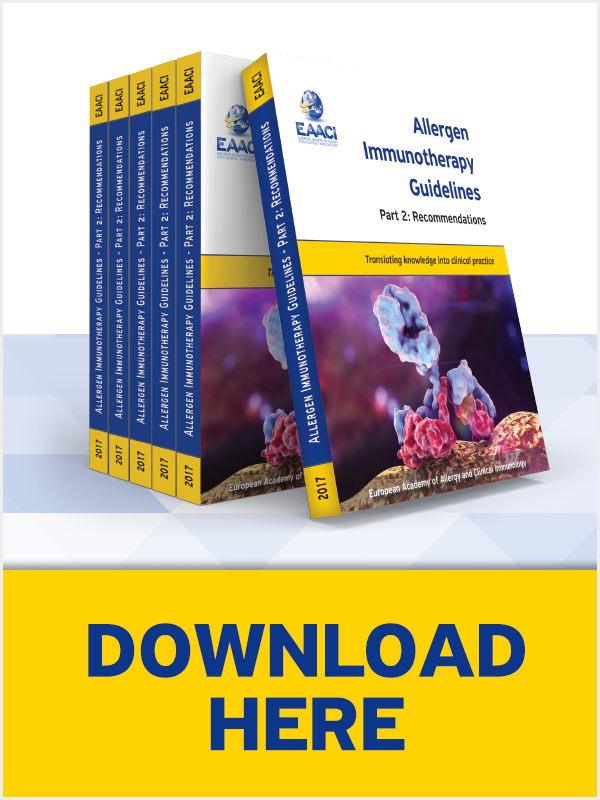 Almost all the EAACI groups have worked on these AIT Guidelines. It is thanks to the tireless efforts of the many task forces Chairs, to the Sections and to the Interest Groups that we have been able to develop comprehensive Guidelines. We also need to thank the commitment of the EAACI members who contributed through the public comment, the Board of Officers and the Executive Committee and almost 100 experts from all over the world who have worked with enthusiasm and who have been instrumental to maintain the pace over the last 2 years. I feel privileged for their vision and continuous support. This is, indeed, the start of the journey. Implementing the Guidelines both nationally and internationally will measure the success of this project. We are sure that EAACI members have the strength and dedication to accomplish this achievement.